In this article I will concentrate on the third component of the CMS option in SilverFast Ai and SilverFast Ai Studio. The third section “Embedded ICC profiles” is pretty straightforward, it has one checkbox, an indicator and a drop down menu. 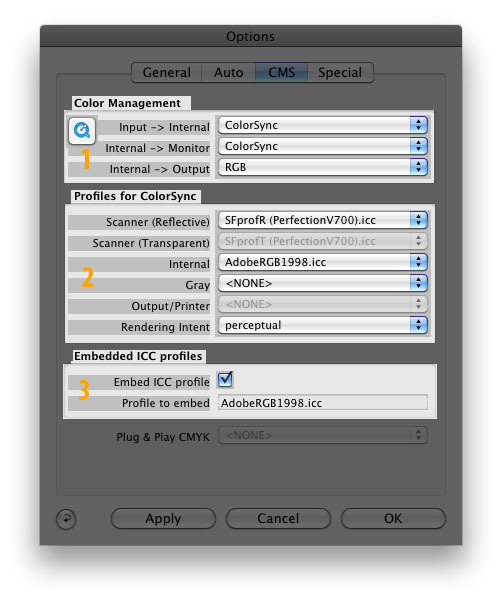 Using this section you will specify whether or not an ICC profile should be embedded in case you decided to use Plug & Play CMYK profiles in the first section, you can then specify which profile should be used. Embed ICC profile. If you mark the checkbox, a color profile will be embedded along with your resulting files, this option is active by default, if you unmark the checkbox, this option will be inactive.